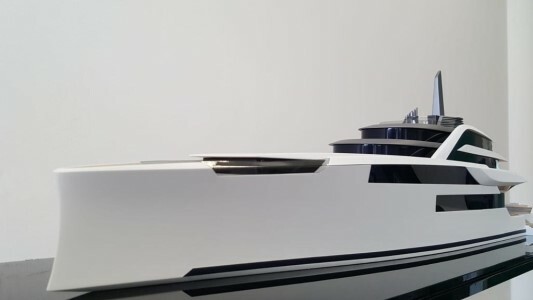 Bannenberg & Rowell and Kusch Yachts who last collaborated on the unmistakeable Le Grand Bleu, have reprised their act with a bold and unconventional 118m motor yacht. The idea was to challenge what you might refer to as typical architecture without going down the path of an unbuildable concept. Our constantly evolving lifestyles are driven both by the past, what we've already seen, and by the future: our aspirations. It's interesting to take these drivers and consider how they affect life on board and define the yacht's architecture and mould its form. The merging of interior and exterior remains an enduring topic and one that we again question and explore. We attempt to bring the outside in, to capture the marine and beach life ‐ hence the merging of these spaces that are no longer deemed outside or inside. Connectivity in a word. 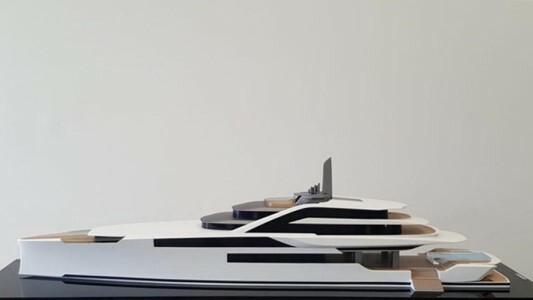 The spine of the boat is the core, the focal point through which the wide, open‐plan stairwell links all decks and binds together the crew stairs, pantries and engine casings. Concentrating these key vertical elements enables more space for the living areas allowing us greater freedom to deconstruct what have traditionally been the cosy inward looking spaces: the salons. 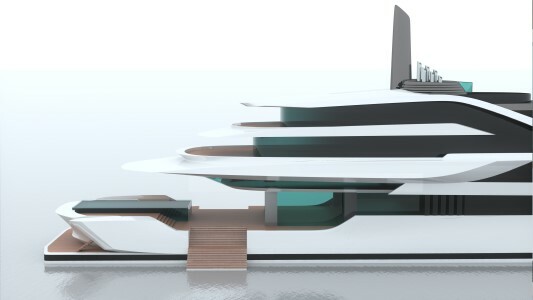 In this case we've lowered the aft main deck area to get it closer to the water level, so it becomes the saddle between the raised pool aft (with the Spa beneath) and the interior going forward. 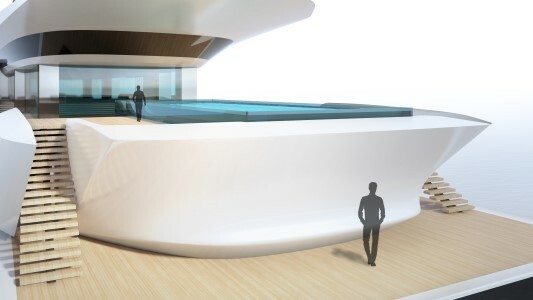 This creates the winter garden lounge, an exterior space divided by steps running full beam, connecting to the elevated section forward and surrounded by sliding glass walls providing the transparent envelope to control temperature and humidity. Lowering the floor is akin to raising the ceiling, affording the space a sense of scale and grandeur with 4m ceiling heights. 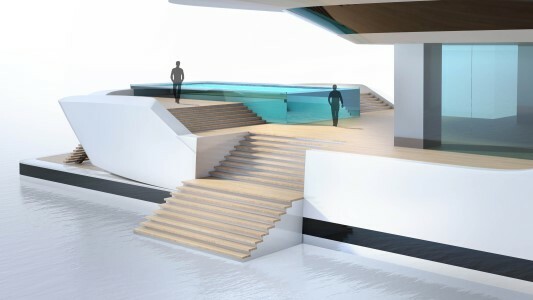 Aft of the sliding glass walls, the side decks on port and starboard fold out to become expansive stairwells leading to the water, and also provide access to the beach toy store beneath. Looming high above this space is what appears the superstructure's underbody; a sunken observation salon hung beneath the wide coamings of the upper deck which then opens upwards internally into the main salon and dining on owner’s deck. In this elevated position, the more traditional dining and lounging is naturally provided with panoramic views and opens up to wide side and aft decks. 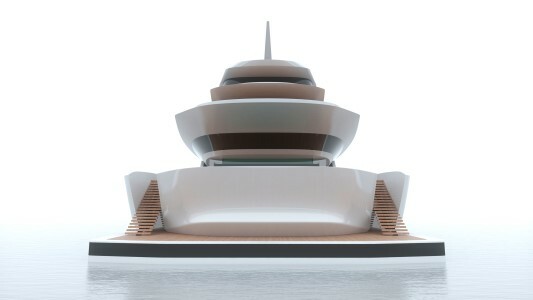 A‐pillars either side of the forward superstructure act as a physical and visual divide between the owner's forward looking double height suite and the rest of the yacht. 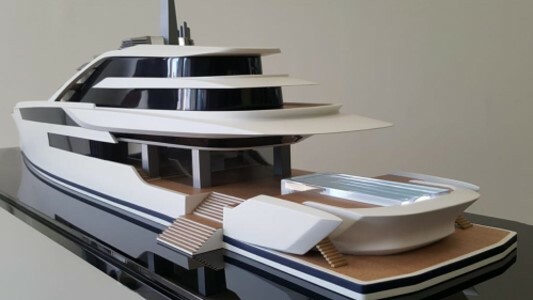 Further forward, the wheelhouse is perched on top of the hull keeping it away from the guest and living spaces but close to the crew's quarters to ease their movement around the yacht and contribute to efficient operation. 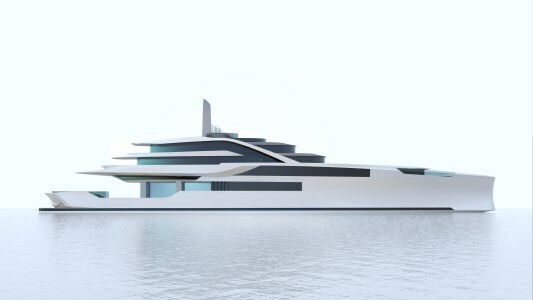 As such, the yacht's architecture and form has developed progressively and conceptually around the functional needs of the guests and crew, whilst casting many of the current styling conventions to one side.